(Newser) – Young French soccer star Kylian Mbappe had an amazing World Cup and while some say it's far too early to compare him to Pele, Pele does not agree. After France's win Sunday, the 77-year-old Brazilian soccer legend, the only other person to score in a World Cup final as a teenager, tweeted: "If Kylian keeps equalling my records like this I may have to dust my boots off again." Mbappe, 19, is also the only person after Pele to have scored two goals in a World Cup as a teenager. 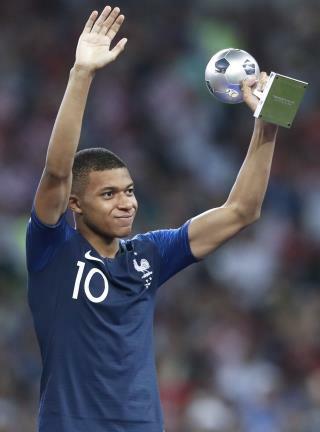 The Paris St. Germain player, who scored a total of four goals in the tournament, received the World Cup Best Young Player Award. Interesting how such a positive piece of news still manages to INSPIRE some to reference our President and or his supporters. How much would France tax him anyway on his winnings? 75% sounds about right. Might as well give the money away to people you think deserve to have it.